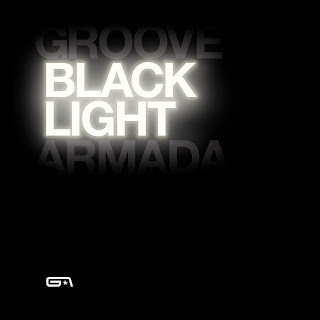 Next I would like to take you to the wonderful electronic landscapes of the music of Groove Armada. They are a British electro-house duo whose music you have heard before, believe it or not: they've scored international hits with singles such as "My Friend", "I See You Baby" and especially their chill-out classic "At The River". (Ah, listening to these songs takes my back to my mid-teens. Good times.) The album I'm reviewing is their latest studio album of strictly new songs (I'll get to this later) and was actually released already three years ago, in 2010. (Goodness, has it been so long already?) Black Light sees the duo adopting a more rock-oriented sound à la their Lovebox era, at least compared to its predecessor, 2007's Soundboy Rock (which was a brilliant pop album that I might have to review some time), and also features heavy '80s influences. So, basically, it's a mixture of pop, electronica, house and rock. Interested? Keep reading then, will you. The change of musical direction becomes evident already in the first seconds of the opening song "Look Me In The Eye Sister", as there are much more guitars now. As a matter of fact, the first time you hear the song, you could even mistake it for an indie rock track, which isn't really a bad thing though, and at the same time it also retains that distinctive Groove Armada touch. "Fall Silent" is a nod to '80s synthpop, namely New Order. It avoids sounding like a pastiche, however, and develops into a fresh-sounding, modernised electro pop number. "Just For Tonight" is a melancholic pop tune and one of the highlights of the album. It's very simple - mainly backed with acoustic guitar, drums and synths - but it works perfectly just as it is. "Not Forgotten" feels a bit like The Cure going electro, and tells a story of a past relationship that is hard to get over: "Can't stop the world, reminded me of you / My heart strings swell out of tune". Now, Groove Armada have never necessarily been your typical 'lyric' band - "I See You Baby", I'm looking right at you - and I guess that's to be expected from an act that makes dance music, but there are some rather nice lyrics here. "I Won't Kneel" is a wonderful electropop tune which is about the difficulty of apologising when you're a proud-natured person: "'Cause I know I'm a victim of my pride." It's rather relatable, isn't it - it's never easy. "Cards To Your Heart" sounds like an upbeat brother of The Knife's "Heartbeats" and has that whole 2000s indietronica '80s revival thing (or whatever you call it) going on. Then comes "Paper Romance", a definitive standout moment, and the 'anthem' of the album. It also has probably the best chorus on Black Light, and might or might not be about the fear of long-distance relationships: "Yeah you can write me a love letter / But there's nothing to say / I don't wanna take a chance on your paper romance anyway". Whatever it's about, it makes a nice singalong moment nevertheless. "Warsaw" is another triumphant moment, and its repetitive vocal parts are occasionally nearly punk rock-y. Nah, it doesn't sound as baffling as it looks written. On "Shameless" the duo landed quite the featuring vocalist with Bryan Ferry of Roxy Music fame. The song itself begins with a French spoken word intro, something they also did on Soundboy Rock's "Paris". Influences of David Bowie and the aforementioned Roxy Music can be heard, but then again it's the lead singer of the latter who's singing. "Time & Space" is yet another brilliant electronic track with gloomy undertones, which doesn't by any means you couldn't have multi-layered synths, electric guitars and a pop beat on it. Finally comes "History", ending the album with (once again) an '80s inspired synthpop number that speaks of a person apologising his harmful ways before acknowledging how he involuntarily always repeats the same pattern: "So wrong, it's just history repeating / it keeps following me around / So wrong, I'm sick of history repeating / because it keeps turning me around". While it is a nice, confessional dance pop tune it isn't exactly the best choice for an album closer out of these 11 songs. As you might notice by now, the '80s references on this album are rather notable. It's always a double-edged sword to openly show influences of one's idols when it comes to creating own music (or anything else either, come to that). While the artist sees it as nothing else but a nod to the past, others might see it as blatant copying. And sometimes that is indeed the case. However, I'm glad to announce that Black Light is better than that. Sure, the record might not be as groundbreaking as some of their previous efforts (especially the phenomenal Soundboy Rock), but it's still distinctively Groove Armada. It sounds fresh and modern even despite its ubiquitous '80s influences. Try at least: "Look Me In The Eye Sister", "Just For Tonight", "Paper Romance", "Time & Space"
Interestingly enough, the duo decided to release a compilation of new, reworked versions of the album tracks in the form of White Light later the same year. Obviously these two albums form an inseparable pair, and I actually planned to write the review about White Light instead but soon found it impossible to write about one without the other. So, consider this as part 1, part 2 will be on its way shortly.